A fast-moving snake with a long thin body and tail, a broad elongated head, large eyes, a slender neck, and smooth scales. Olive, blackish, brown or dark gray on top and cream below which becomes yellow or pink toward the tail. Grayish white or cream stripes runing lengthwise along the sides with narrow dark lines, often broken into dashes, running down the middle of the light stripes. 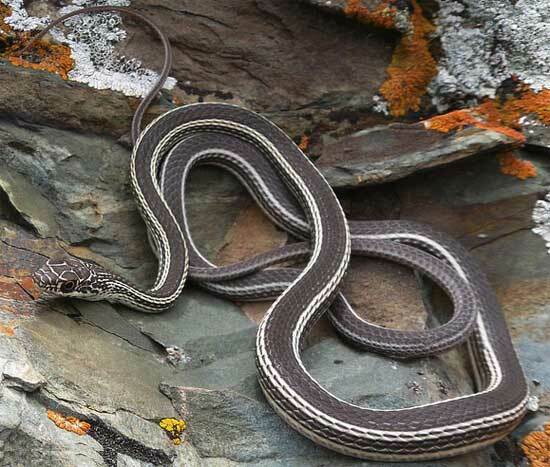 A very fast-moving alert diurnal snake with good vision that is difficult to approach. Often crawls away very quickly when frightened, but when cornered will strike fiercely. Forages with the head elevated off the ground using vision more than scent to find prey. A good climber, often moving quickly through bushes. Eats lizards, snakes, small mammals, birds and bird eggs, amphibians. Juveniles will eat insects. Mates soon after emergencee in the spring. Males will engage in combat for access to females. Lays eggs in June and July which hatch in 2 - 3 months. In California, occurs from Siskiyou county, near the junction of the north and south forks of the Salmon river, east into the Great Basin region of the northeast corner, down the eastern side of the Sierra Nevada Mountains south into the Owens Valley and along the California Nevada border. Ranges farther north into Oregon, Eastern Washington and Idaho, and south and east into Nevada, Utah, Colorado, Arizona, New Mexico, and extreme west Texas and south into Mexico. Occurs as high as 10,100 feet (3077 m) in the White Mountains. Occurs in open brushy country - desert scrub, sagebrush flats, mixed woodlands. Often found along the edges of rivers or ponds. There is one other subspecies of Coluber taeniatus - C. t. ornatus - Central Texas Whipsnake, which occurs east of the range of C. t. taeniatus.